Pewar Rinpoche Chimé Dorje (Wyl. dpe war rin po che 'chi med rdo rje) (b.1933) is one of the most revered lamas in Tibet today. He was a student of Jamyang Khyentse Chökyi Lodrö, from whom he received many teachings and transmissions. He lives in Derge. 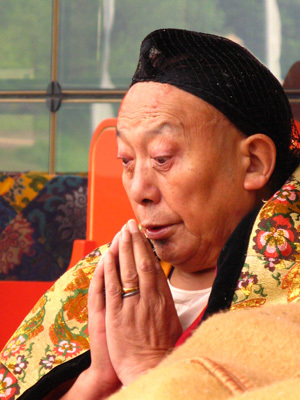 Regarded as an emanation of Virupa, one of the 84 Mahasiddhas of India, Pewar Rinpoche was a favoured companion of Dilgo Khyentse Rinpoche, the late head of Nyingma school. Dzongsar Khyentse Rinpoche has also received teachings from him. Pewar Rinpoche has made remarkable contributions to the revival of Buddhism in the Kham region of Tibet. Aside from being the abbot of Pewar Monastery in Tibet, he has also guided the work of the “Commission for the New Tibetan Tripitika”. Pewar Rinpoche is active in the preservation of Tibetan Buddhist Art and texts. He helped to preserve the Derge Printing House during the chaotic times of the Chinese invasion. In 1959 the Chinese Government launched many campaigns and forced lay people and monks to participate in the destruction of many monasteries, but the great Derge Gönchen Monastery with its famous printing press was protected by order of the central government. Pewar Monastery houses one of the finest sets of Buddhist murals in western Sichuan. Its paintings, which are more than 270 years old and cover more than 370 square meters, survived the destruction of the Cultural Revolution. This page was last edited on 9 January 2018, at 17:54.